One of the real blessings of Family Friendly Gaming is being able to work with so many wonderful people throughout the industry. Don't get me wrong, playing the games is great, but getting to know so many wonderful people in our industry is even better. Case in point, we are playing Pushmo thanks to a wonderful person inside the video game industry. They know who they are. And those of us in the media need to say thank you more often. I am very thankful that I am afforded the opportunity to play Pushmo. This cute little Nintendo title is downloadable on the Nintendo 3DS. And Nintendo put together a wonderful game that is a definite sleeper hit. Even though this game is called Pushmo, it feels more like Pullmo to me. Let me explain. We pull blocks out (up to three spaces), and then climb up until we free the child trapped in the structure. The structures is where Pushmo really shines. These puzzles are of a variety of objects. Things like Mario's head, or a shooting star. If you do not like the two hundred and fifty puzzle levels, then you can create your very own. Yes Pushmo comes with its very own level editor. Or you can download what other players have created. Nintendo put a lot of thought into Pushmo. The cute little characters, soft graphics, and bright colors makes Pushmo an instant winner. There is a mischievous child who needs a spanking in Pushmo. He winds up hitting the reset button which traps the other children in the structures. Our character embarks upon a mission to save them all. The storyline in Pushmo fascinated me, but not as much as the puzzles. The level of creativity put into Pushmo is insane. I could never come up with that much content on my own in ten years. As I played through Pushmo I learned new skills that were important to solving puzzles. The most important one is the reset button when a mistake is made. I had a blast playing Pushmo. This is a solid puzzle game that utilizes the technology of the Nintendo 3DS masterfully. 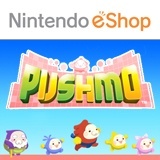 Pushmo is one of those rare titles that earns the Family Friendly Gaming seal of approval. I hope Nintendo continues this franchise for years to come. It is the best downloadable game on the Nintendo 3DS.